Every year on Chinese New Year day, I order Chinese food and have a solo buffet of: vegetable lo mein, chicken wings, shrimp fried rice, egg rolls, and if I have enough money, stir-fry pepper steak. I am in love with Chinese food. I don't know if it's the MSG or the sheer enjoyment of the cuisine, but Chinese food really makes me happy. When I was a teenager, I vowed that I would live in a greasy little apartment in a metropolitan city above a Chinese restaurant so I could go to sleep with moo goo gai pan wafting up my nose. This year I was ill, so I did not get to partake in the annual buffeted affair. Instead, I attempted to make egg rolls at home and eat them in abundance. 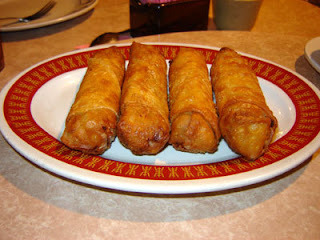 Disclaimer: This photo is not of MY egg rolls, but of egg rolls consumed yesterday at the local China Buffet. Mine were so delicious, they were eaten hot and fresh out of the oil before I remembered to take a picture. Sadness, I know. Mix seasoning ingredients together. If using chicken, add the seasonings and marinate for 10-15 minutes. If using pork, cut into thin strips first, then marinate. Mix gravy ingredients and set aside. Heat large skillet or pan over medium-high to high heat. Add the oil for stir-frying. When the oil is ready, add the celery and onion and stir-fry. Note: If you have a wok, use it. I don’t own a wok. The “stir-fry” I refer to is really a sauté because no wok is present. UPDATE (2/11/08): I found a wok! My favorite culinary store Sur La Table has a wok. 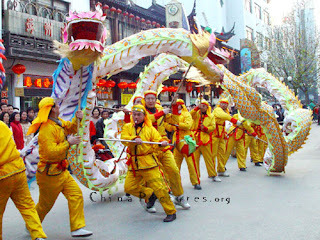 Such an inexpensive way to get to China! Taste and add salt and sugar if desired. Remove from the pan. Add the pork or chicken to the wok and cook until done. Remove from the pan. Clean pan and stir-fry bean sprouts and the cabbage, covering and cooking for approximately 1 minute. Add meat back into pan. If necessary, drain some of the juice from the vegetables out first. Push the vegetables up against the sides of the pan to form a well in the middle. Add the gravy mixture and stir to thicken. Mix thoroughly. Add green onion. Set the filling aside to allow to cool before wrapping. Lay the egg roll wrapper out with the short (4 1/2") side directly in front of you. This will be the dry side. The two long sides will be called sides 1 and 3, and the other short side directly across from you will be called side 2. Place approximately 1 tablespoon of filling in the middle of the wrapper, spreading it out but not getting too close to the edges. Using your fingertip, spread water along edges 1, 2, and 3. Fold over the dry side, then take side 2 and fold it over, making sure the two sides overlap. Press down firmly on sides 1 and 3, making sure they are well sealed. When oil is ready, slide each egg roll carefully into the pot one at a time. Deep-fry until they are golden brown, then drain on a rack, brown paper bags, or paper towels. Keep on a tray lined with fresh paper towels until needed. The egg rolls should not be stacked.